Once again, we come back to one of our blog, this time to roll a few smaller posts into a bigger one. As the picture above shows, the area at Holleman and Texas Avenue is now a large (kind of low end) shopping center. In addition to covering all the changes that went on there (which I have yet to do), I can combine a few older posts into this one. 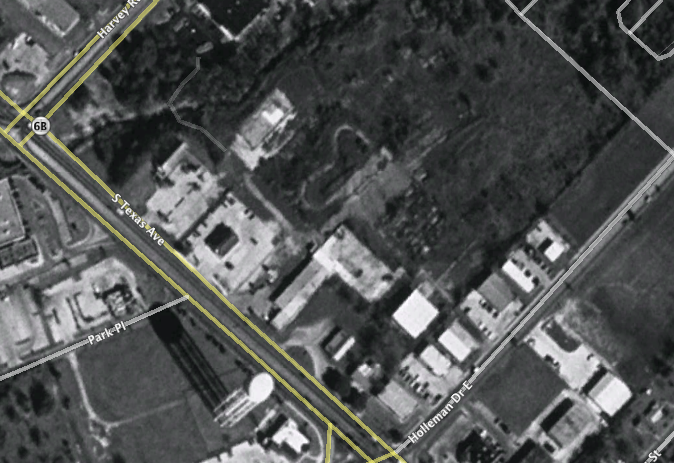 So, first, we have Pooh's Park at 1907 Texas Avenue South. I never got to experience Pooh's Park myself, but from what I've seen and read, it was like Chuck E. Cheese, Putt-Putt, and a skating rink (roller, not ice) all wrapped into one. It opened in 1972 and was where the shopping center where Hobby Lobby, Big Lots, and Ross are now. I would like to say that Pooh's Park remained open until it became too valuable to remain (and was getting run-down anyway) and closed in the early 2000s, but no, that's not the case (it is very similar to a certain defunct theme park that closed about a decade ago, though). It closed in by 1989 (at that point, the phone book no longer lists it) and only the sign remained up (with the logo of the yellow dog they had, and not the one pictured above, and the name gone) until around the time they built the shopping center in the early 2000s, and then remained up until a little while afterward. A 1984 phone book has a different ad that does mention things like a water slide (408 feet) and a different address (at some point, they changed to 105 Holleman, though based on what you can see from Google Earth, and backed up by a picture of Texas Avenue from a local history book I don't have a copy of with me) is that Pooh's Park was accessed through Texas Avenue, not Holleman. 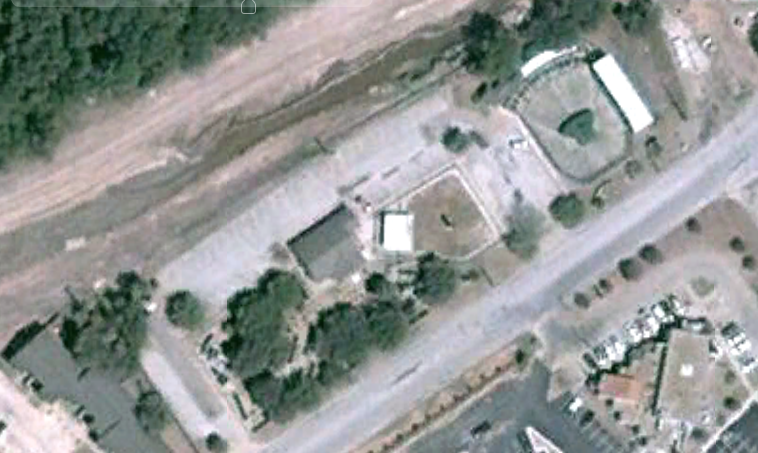 Some older maps (circa 2001-ish, long after Pooh's Park bit the dust) put a "Pooh's Lane" roughly where the Bahama Buck's is now, but unless that first part of Holleman Drive East was actually called that (after all, there's a few things that do support that, including the odd alignment of Holleman Drive and Holleman Drive East suggests that the East part was first, and then Holleman Drive extended that way later by way of a particularly awkward curve, or the fact that the subdivision nearby (behind the strip center and the other businesses on the east side) is named Pooh's Park Subdivision. Sharing the address with Pooh's Park (at least the original address) was one "Furniture Liquidation Mart" which closed in October 1985 (The Eagle), and I would guess that this is what Bahama Buck's replaced (it used to be the foundations of another building). It should be noted, though, my 1984 phone book doesn't list it. 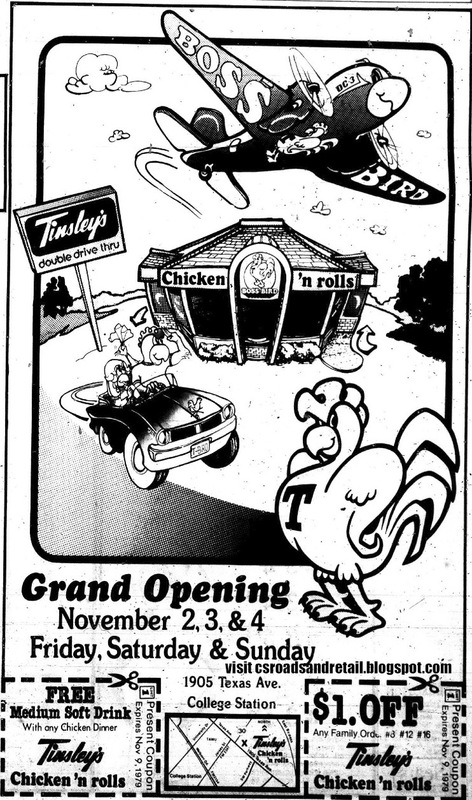 Near Pooh's Park was Tinsley's Chicken 'n Rolls. Chicken done well, chicken well done! 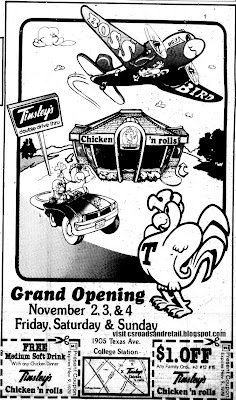 Opening in late 1979, Tinsley's was located on 1905 Texas Avenue but was closed by 1989 after the Tinsley family sold out to Church's, which would eventually close or convert the restaurants (I don't think this restaurant was ever converted). Later, it was Kokopelli's (by 1998), and soon after, the Clay Oven (by 1999), a quick-serve (cheap!) Indian restaurant. This location, unfortunately, was razed for the shopping center, but Clay Oven was already closed by then. I have no actual pictures of what the building looked like in reality, nor do I remember Clay Oven being there at all. Sad, isn't it? The plane was a real thing, though, David Tinsley used an actual 1930s plane to promote his restaurants, not unlike how Flying Tomato used hot air balloons. While the "Boss Bird" made a brief appearance in Huntsville (after a long period of total absence), it is now closed (now a Hartz Chicken Buffet). It wasn't particularly to die for (although I think the "dried out chicken" complaints were an over-exaggeration, at least from what I saw in my visit). There were a few other places on Holleman that later disappeared beyond Jot 59 (see picture), though one of them was a quick-lube auto place (name escapes me). 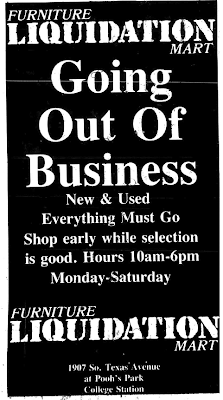 So anyway, all that was torn down for the shopping center (University Shopping Center, the name of which wasn't promoted), which opened around 2003 (after the H-E-B, I remember), with many of the stores it has today (Hobby Lobby, Shoe Carnival, Ross Dress for Less, Petco). Hobby Lobby moved from their old location at Post Oak Square, with the others being new. There was a branch of Loupot's, CiCi's (which came a few years later, as the old Culpepper Plaza was partially demolished), and a Goody's Family Clothing. Goody's would close in early 2009 as the chain went under, but it was replaced with a few new stores, Big Lots (returning back to the market, as by that time, their old location at the former Kmart had been closed for several years) and a Twin Liquors (which, despite slightly nicer décor, seemed like a smaller, inferior competitor to Spec's). Another shopping strip was built around the same time as the rest (but named The Shops at Wolf Pen Plaza) with Starbucks Coffee, a Sprint store (which initially had the older logo), and Champion Firearms (moved from the Kroger shopping center). The passing of Parker-Astin Hardware (alt. Parker-Astin Hardware & Gifts, 108 North Bryan Avenue) didn't go unnoticed here on this site (the "Gifts" part was known even back in the 1970s), so I added a picture I took to memorialize the store. I'm happy to say I went into it once but unfortunately didn't take any pictures, and pictures are pretty rare today (sorry). An alternate photo of the facade can be found here. Other than that, I've got nothing, and this is no longer "canon" to the blog since I don't really have enough to give a write-up on it. The time is September 1997. Rock Prairie has just recently or is in the process of extending from the stub where it abruptly dead-ended at Victoria Avenue all the way to Wellborn Road. Using the rural back road of North Graham Road was about to end, and in February 1998, a railroad crossing connecting Gandy Road and Rock Prairie Road was approved. It was this time that Alta Vista opened. The Rock Prairie extension only had a street sign (Wellborn/Rock Prairie Road) and a stop sign (along with a new Exxon station that opened, which included an A&W). Beyond the railroad was a dusty road ending at a yield sign. This was Gandy Road. Though a dusty, rural road, it included the Diamond T Stables and Storage (still with "3270 Gandy" on the address to this day), some sort of facility that looked like a fish farm or water retention (little ponds in the back), and Alta Vista Christian Academy. My only experiences of Alta Vista came from exploring the new extension of Rock Prairie after it opened circa 2000-2001. The new extension was fascinating: there was a dip in the railroad crossing (as opposed to the "humps" in the others): this was taken out when they expanded Wellborn Road. In the early days of the crossing (circa 2001, I believe), there was a four-way stop at Old Wellborn, and several country-oriented places along the way: including aforementioned Diamond T Stables (still with "3270 Gandy" on the address) and of course Alta Vista (a small private school). The new extension went all the way to North Dowling, and then, on the other side, Blue Ridge Drive, which went even further. I remember how the old railroad ROW looked in 2001: it was a sad, gated-off place that was kind of creepy-looking, with the (patchy) I&GN Road going the other way. That was the original ending of Gandy (it curved into I&GN). The rest of the way has the partially-undeveloped Great Oaks Estates, farmland, and another trailer park (substantially less attractive than the ones closer to the old ROW). Of course, all that began to change as urbanization slowly crept west. 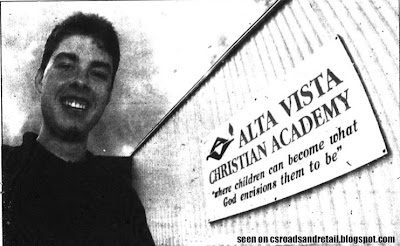 Alta Vista struggled for years, even having to be saved from bankruptcy in the early 2000s thanks to donations, but by the mid-2000s, Alta Vista had folded up and disappeared, with no trace remaining. It's now the Williams Gate subdivision. Editor's Note: Some of this text comes from The Development of Rock Prairie Road, which will be discontinued. Check for updates on Holiday Inn, Sbisa, and the MSC. The index will be updated soon. 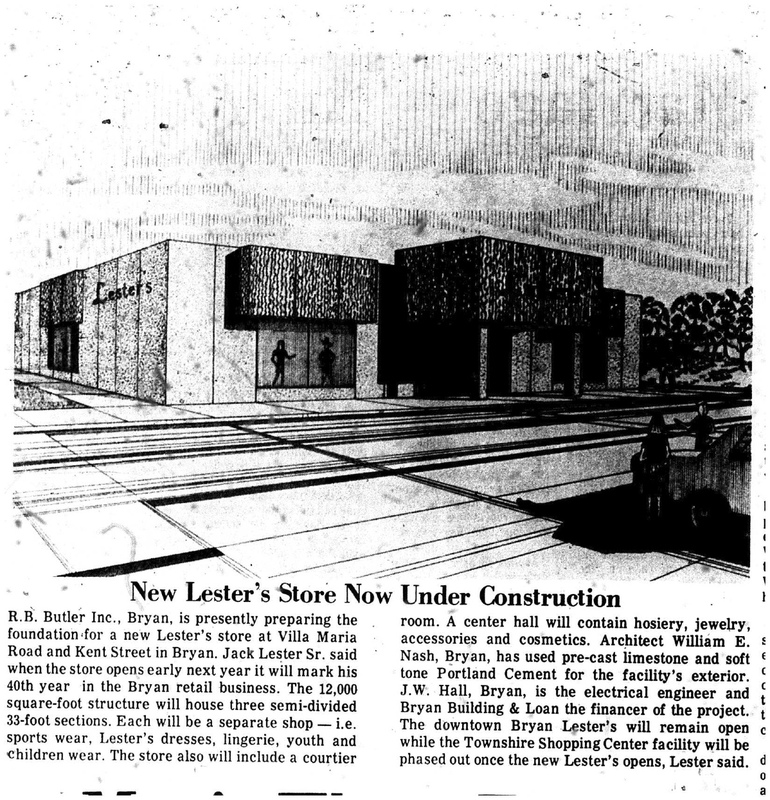 Built as Lester's in 1973 and lasting at least until 1985, this building has sporadically served as office tenants. When I took this picture in 2013, it had been vacant for the last several years (Google searching indicated a "Lonestar Systems Inc."), but within a year or two had been reoccupied by Greenwood Hall Education Solutions, an office for a California-based education technology company. However, the company abruptly folded in December 2017 closing its Bryan office. There's also a painted train Locomotives on Parade still on the premises. It's visible from Google Street View but it doesn't appear to be anything photographed and based on the wheels looks like a repainted version of the Foo Foo Choo Choo, and as of 2013, the tiles outside still read "THE SMART SHOP", referring to "Lester's Smart Shop" in old articles and ads. An anonymous comment says that Houston-based Craig's took over the store shortly after Lester's demise and operated it into the 1990s. 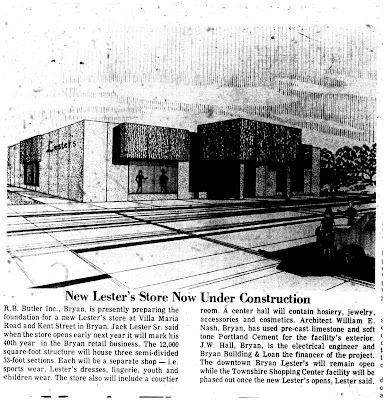 While I haven't researched these dates, I did find that in October 1986, Craig's opened off of Westheimer in a store formerly occupied by the Smart Shop, but this was actually unrelated to Lester's. By fall 1993, Craig's had pulled out of Bryan, having shed 10 of its 23 stores between 1988 and 1993. According to a 1989 phone book, Craig's did have a store here, meaning it was one of the 10 closed. 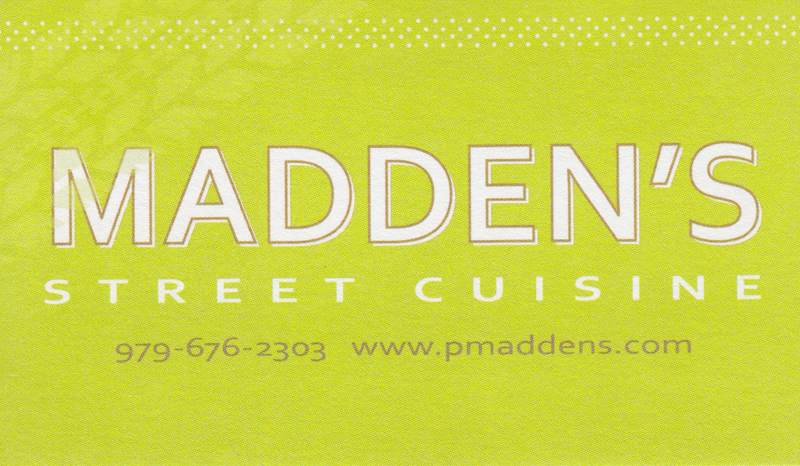 Madden's Street Cuisine, which stopped delivering deliciousness around town early last summer is covered here. I ate there and got a repeat customer card (completely useless now) and a menu, both of which are pictured here for your infotainment. The menu actually was printed on old scratch paper: the other side has some sort of multiple-course "Civil Engineering Staff Appreciation Lunch" with classy things such as "Tomato Bisque garnished with fresh mozzarella, saffron whipped cream and fresh basil chiffonade", but I didn't scan it since it's in poor shape (and only half of the page), and you could order stuff from the actual Madden's restaurant which is very much alive. The 1990s were a pretty sleepy time for College Station, and that was where I spent my youth. Many of these have been covered, but for mini-golf, it was Putt-Putt Golf. Located off Valley View and Harvey Mitchell, and opening circa 1988 (after the 1987 filing), Putt-Putt (no relation to the children's adventure game by Humongous Entertainment), was always pretty small (nothing too fancy, no windmills or exciting options, mostly green carpeting, beginner and less-beginner golf courses), some large fiberglass animals thrown around (giraffe, elephant: trying to with a vaguely "safari" theme), plus an arcade with tokens and prizes (it was really small--I don't even remember it having air conditioning or not, even as of circa 1999), a batting cage, and a small area for bumper boats, the only place in town for them. I later discovered that the establishment opened as a franchised location and taken over by the main company in 1991. The blurb that I found mentioned it had been expanded slightly, though I don't know what features they actually added. While the bumper boats and mini-golf were unique, it was no Gattiland. If you wanted to have fun as a kid in those days or wanted a cool place to have a birthday, you went to Gattiland, case closed. The logo. It's an edited version from Putt-Putt of Rome, Georgia, which did not update their logo, enabling me edit it for the purposes of this article. Probably because of that fact (and everyone knew it), Putt-Putt just got sadder and more run-down over the years. The bumper boats went first, closing in the early 2000s (not that it was very big, I think it could only fit four), then the Putt-Putt name ("Brazos Valley Golf & Games" was the new name). By 2005, they had converted the bumper boats area to a skatepark, which seemed mildly popular. But by the end of 2006 (or early 2007--help me out here), the whole thing was closed, with only some tattered mini-golf holes, a creepy-looking abandoned batting cage, and those fiberglass animals, now fading in the sun. Eventually the batting cage and mini-golf remnants were demolished, and the bumper boats area filled in for good for its new tenant: Paradise Scuba, which relocated from Parkway Square. They doubled the size of the old arcade building, even adding in a swimming pool inside (why they didn't use the old Bumper Boats area, who knows). They did, however, leave the lighthouse from the bumper boats area, though the lower rungs were removed so you couldn't climb up. 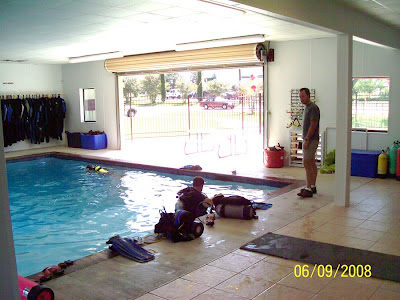 Paradise Scuba opened in September 2008 closed in June 2012 for good, despite the renovations to the property. 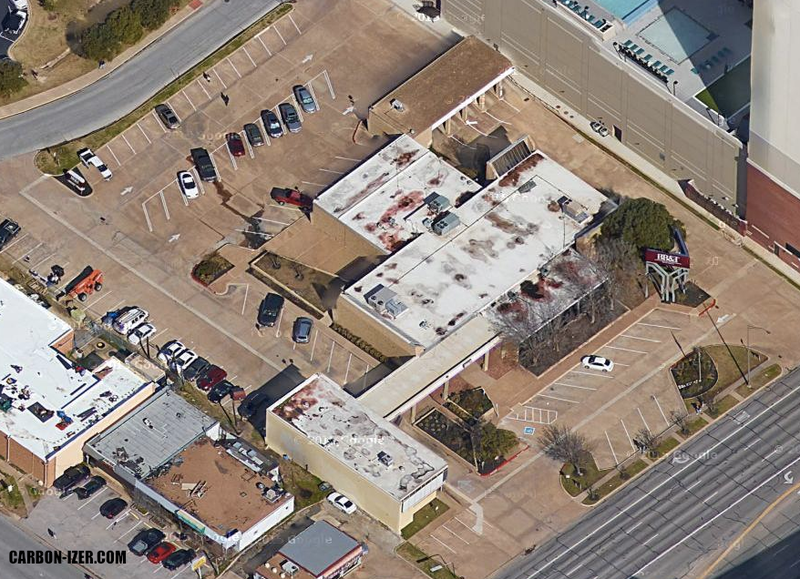 Two years later, it reopened as a second location of Aggieland Cycling, which presumably filled in the pool inside. Neither business used the old batting cages area, and in late 2016, Domino's Pizza began to build a new location there (replacing their location on Texas Avenue near Deacon and Sunset Gardens), which opened in April 2017. Weirdly, the official "entrance" to the pizza restaurant is the far side of Aggieland Cycling's parking lot, the closer driveway (shared with Aggieland Cycling) is supposed to be an exit-only lane. Going back to Putt-Putt, it lasted over a decade, but to this day, we don't have a real mini-golf place. Sure, Grand Station Entertainment, the only place for bowling (Triangle Bowl and the MSC met their demise around the time Putt-Putt closed up shop) or mini-golf (of the "glow in the dark" variety, and they've got some sort of weird Western theme going on. If you want to golf in College Station, you'll have to stick with real courses and driving ranges. Extensively updated in July 2014 with new tenant and picture, then again in 2015. In October 2017, a number of later updates were integrated. 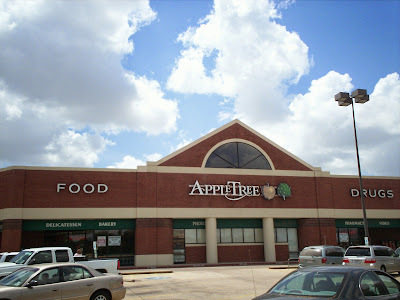 When this post originally went up back in September 2011, it was a look at a former AppleTree that converted to something completely different...and that "former AppleTree" was a Safeway that was one of the last (if not THE last) in the Safeway Houston division. It might have even opened after the division spun off but before the name change. I really don't know. There was a brief time when the stores were advertised as Safeway, but were "locally owned", probably due to a lingering licensing deal to use the name from Safeway. AppleTree started out with nearly 100 stores from Waco to Rosenberg, but the crippling debt resulting from the buyout forced the company into bankruptcy in 1992 and sold off its stores in late 1993. For whatever reason, six stores were purchased back and remained as AppleTree stores. 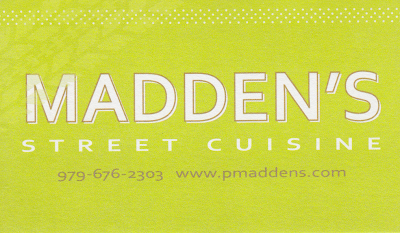 The Briarcrest store was one of these, and it was bought as part of the last six by Tony Kubicek, who bought the name and operations of the stores, with the possibility of even expanding at some point. Unfortunately, this never happened, and AppleTree started to shed stores again. By 1999, only three remained, all in Bryan-College Station. 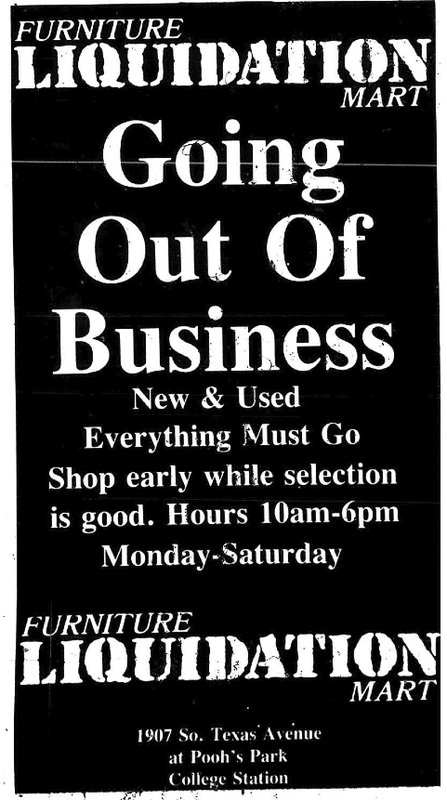 After the closure of Culpepper Plaza's store, it went down to 2. This AppleTree held its own, even having features that no other grocery store did (like making its own sausage), though despite being laden with AppleTree logos and having many of the same employees since the Safeway days (and still does) wasn't like the old AppleTree company (it was unionized, for one). It's unknown to what exactly went on with AppleTree corporate, but in 2008, the supermarket was sold after Kubicek wanted a lower rate on rent. His landlord ended up buying the store instead, and Jim Lewis, the landlord-turned-owner, decided to make it his own. While the actual change of hands occurred in 2008, there was a "Grand Opening" in March 2009 (I've never been able to find out if the store closed for a reset, but from all I've heard, there wasn't). Around this time, the store updated its dated 1980s department graphics to new Benjamin Knox paintings, and revised the merchandise selection to include more organic (and later gluten-free) items, as well as local items. VF heavily relied on the "local" schtick considering that the area had lacked a real "local" supermarket since the closure of independent Food Town (not related to the Houston chain) located at 600 North Main in the early 1990s (it was open in 1991, but not too much longer afterward), and the fact that no other supermarket really focused on natural and organics food like they did (gluten free wasn't as trendy when it opened). Already problems were apparent, though, as the mix didn't reciprocate well with everybody. One of the misconceptions that the store had to overcome was that it was some sort of Whole Foods knock-off, which it wasn't, and actually scared off a few loyal customers who (wrongly) believed the prices had shot up, while anyone expecting some sort of Whole Foods-type experience (or even a Sprouts-type experience) would be extremely disappointed. For a time the original post here went down from the website due to a "conflict of interest" in summer 2013 (guess why?) and then it went back up again with a new selection of photos. For an inside look at Village Foods (including the photos that used to be here), check out the post at the Safeway & Albertsons in Texas Blog. In 2015, it was announced that an Aldi would join the grocery mix in the area at an undisclosed place in Bryan. Some hypothesized perhaps the underserved west part of town, but instead would be at the corner of 29th and Briarcrest...the site of Village Foods! In December the store announced officially it would close in early February. People have said that Village Foods collapsed due to competition, but despite being between a huge H-E-B and a huge Walmart Supercenter, I don't think that tells a full story. After all, this store has outlasted the bigger and nicer store at the other end of 29th (that would be Albertsons, formerly a Randalls) as well as the supermarket in between (Winn-Dixie). Heck, it even managed to ultimately outlast the Walmart Neighborhood Market off of Texas Avenue. There were a number of factors that worked against Village Foods. In 2013, Briarcrest was plagued with construction, which ended up sealing off the main entrance of the store permanently. The remaining "other" entrance from Briarcrest was a bit awkward to turn in and out of since it was shared with the nearby Galleria Village office tower, with the other entrance being a side entrance off of 29th Street. The high school brought riff-raff and fighting into the parking lot. Their product mix featuring organic, gluten free, and health foods began to become less important as H-E-B and even Walmart to an extent began featuring those types of items. Combined with the already-rough competition with a Walmart Supercenter half a mile to the east, a large H-E-B a mile to the west, and the addition of a Walmart Neighborhood Market within a two mile radius, it was a surprise that Village Foods was able to survive much at all. Since Village Foods is dead and gone now (and no, despite the presence of Lewis' new Village Foods & Pharmacy at Broadmoor and 29th, for all intents Village Foods as we knew it is gone), I'd like to share a few stories regarding this store. The store was pitifully low-volume in the last few years of its life, but the upshot of that was that it was never jam-packed like H-E-B is, even during peak times (plus it was vastly overstaffed in the front end). It was still the best place to order more obscure food items, as well. They ordered Cel-Ray for me in late 2012 when I requested it, and it even carried it up until Village Foods closed down in February 2016. I won't forget that sort of service. The rotisserie chicken was also quite good and was surrounded by delicious pectin (it always smelled great when it was being bagged). Juicy yet not greasy like so many other roti chickens are (I'm looking at you, H-E-B), I'm afraid I'll never have anything quite like it again. If I recall, the chicken did use orange juice as one of its ingredients in preparation. Since day one, the store had a luncheon area, which for many years created its own in-house pizza (reports are that while unremarkable, it was decent). Soon after the demise of Stover Boys at Westgate Center, Charles Stover was brought on to manage the luncheon and deli area, which was merged into "Stover Bros. Café". I only went to the pre-Stover deli once--it originally offered "Blue Plate Specials", which were things like lasagna, but Stover soon expanded the menu to include gourmet hamburgers and fries (carryovers from Stover Boys) but unfortunately wasn't able to use/brand everything due to complications from the Stover Boys bankruptcy. Stover changed some things in the deli, including vastly expanding the deli meats and cheeses to the standards of other supermarkets (I remember the part that originally faced the front of the store, which now has Boar's Head deli meats, originally had things like chips, including a brand of tortilla chip I enjoyed). While much of the traffic from Stover Boys was gone except for a small band of loyalists, Stover Brothers eventually built up a new following, enough to talk about expanding the seating (which they never ultimately did do). While Stover was free to build his menu from the stock "burgers and fries" to include more gourmet burgers and unique sliders (and we aren't talking the Krystal/White Castle fast food variety, although neither are in the area), there were some things left by the wayside: the milkshake sales went way down, so their homemade Mexican Vanilla ice cream was replaced with stock Blue Bell "Homemade Vanilla". Also killed was the "White Trash Donut" (later rebranded to "Southern Fried Doughnut"), which was amazing but hard to make (and really bad for you, but that's beside the point). Since the donuts are no longer available, you'll have to do with this description of them. See some early menus and stuff by visiting Yelp. Also, despite Stover's departed presence, many items remained permanently changed, like the potato salad. 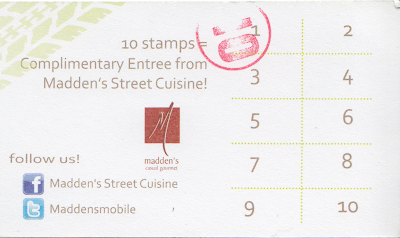 2013 did bring the temporary addition of Hebert's Cajun Food, having been evicted of their shack at University Square, and briefly operated out of the "Southern Comfort Road Trip" food truck Village Foods had. 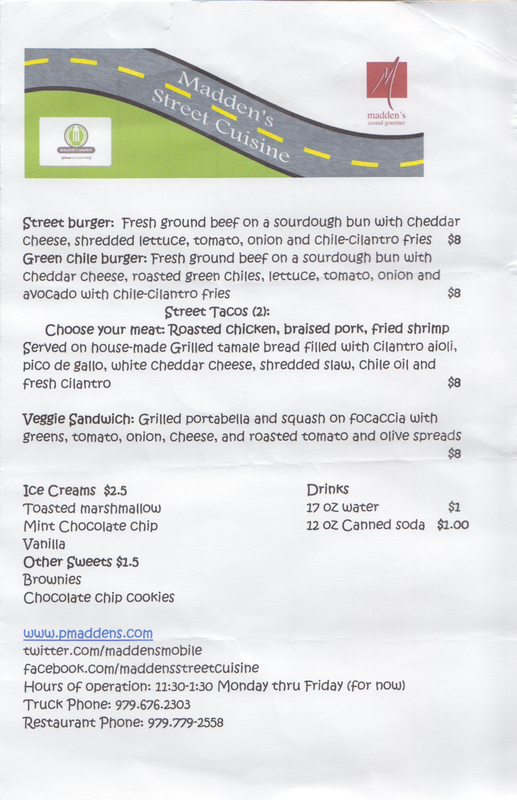 There were plans to run it out of a food truck but the last update was close to two years ago. As far as I can tell, Hebert's Cajun Foods is gone gone (though rumors are once again abounding of its return). Now that we're done with Village Foods, what happened next? Over 2016, the building was slightly altered, including removing the peaked roof for what would be the Urban Air Trampoline Park, but also adding ALDI to the eastern third of the ~50,000 square feet building (on the left side if you were looking at it head-on), though it completely gutted the building, down to removing even the concrete floor (I went inside the building during construction, until a contractor chased me out for not wearing closed-toed shoes). The only thing really left is the columns, and despite ALDI's fairly bare-bones nature, it is much cheaper and much nicer than Village Foods ever was. Perhaps it will eventually become grody and run-down, but for now, it's a clean, nice store. Urban Air opened over a year later in January 2018 with the new 1758 address though I don't know if they used the upper level of Village Foods. Minor paragraph added on March 18, 2012, rename from "Koppe Bridge"
Today, most people associate "Koppe Bridge" as one of the tasty local hamburger joints in town, but at one time, it was an actual bridge. The problem? It's gone. Totally. Here the bridge is in the 1960s. That's not an eye trick, the bridge has literally twisted and was condemned. But surely there must be some remnant left. After all, the support columns of I&GN railroad are still on the Navasota River, right? Right, so there must be remains. Not so: I've combed up and down the Brazos River and can't find any trace of it, at least on Google Earth. A map reveals the location of the bridge, so it must be right here (ignore the mislabeling, they screwed up Penberthy's location in the past). The other side of the bridge must have gone up the other side and gotten back to FM 50. Shame they condemned it, it would be cool to have some backwoods/backdoor entrance to Brazos County, and an old-timey steel truss bridge at that. Realistically, though, if it DID survive, I think it would probably be transformed into a walking path nonetheless, much like bike paths that go through nowhere only because the path was an old railroad right-of-way. UPDATE 2/6/11: The Koppe Bridge website (for the restaurant) claims they incorporated some timbers from the original bridge. 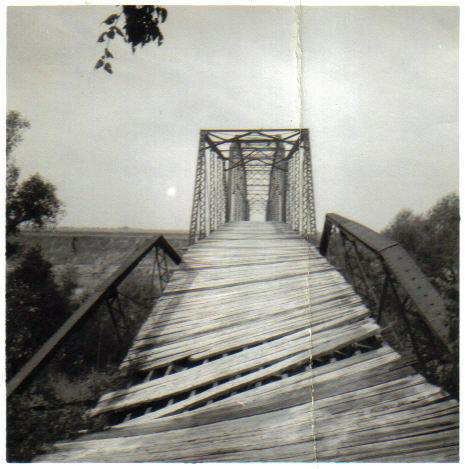 However, they also claim that the bridge was destroyed in the 1920s, when it at least was intact into the 1960s. And since the restaurant opened in 1992, who knows how they acquired it? UPDATE 3/18/11: With the latest Google Maps update, you can see much more of where the bridge was. The previous picture, taken in early 2010, was taken during a very wet year. The current photo now was in October 2011, when the drought was in full effect. Still doesn't look like much. UPDATE 5/15/13: Google Maps has the Brazos flowing better. Looks like some trees are caught on something...and they haven't changed the wrong road name on there!